Took a break from some heavier reading to blow through this book. Having seen the sadly short-lived SyFy Network series, I was looking forward to it. Suffice to say, the series, at least compared to the first book, had the benefit of having the source material to draw from and create an entertaining series. A Good read, but not an Impressive read. If you enjoy stories based upon plot alone, you'll probably like this one. If it takes a little more, such as intellectual dialogue, interesting turns of phrase, and a not-so-liberal use of cliche... well, you can still roar through this story, but you'll feel every bump on the road. 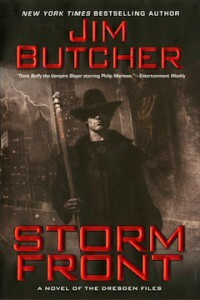 Jim Butcher's book had a lot of promise, but the writing was nothing to get too excited about. Functional, yes. Thought provoking, not particularly. Maybe I expect too much from urban magic stories, but this one fell into a familiar pattern pretty early on. Mainly, meet female character, describe hair, describe body shape, explain attractiveness of said female character, describe mutual efforts to avoid, in most cases, one another's eyes (to avoid soulgazing). These descriptions are never mesmerizing, but tend to be just enough to distinguish one character from another. Of course, we're probably not looking for Laureate-level content, but sometimes variety is welcome and dry can be too dry at times. I didn't dislike this story. It was a fast and easy read, probably because I never had to think too much about it. The most compelling aspect of the story, and probably the only thing separating it from being any old hardboiled detective novel, was the inclusion of magic. Not your Harry Potter sort of magic, where things just happen when you point a stick and say a special latinized or Rowlingized version of a normal word (e.g., the magical word to make something move slowly might be Molassesarium--though, to their credit, powerful magicians apparently don't need to say anything to turn an entire room on fire... some form of the word Immolation would be my guess). Rather, this is more a Ursula K. Le Guin-inspired magic. In order to control something, one had to know its true name, or, at least, the magic had some sort of logical underpinnings--magic worked certain ways for a reason rather than existing arbitrarily. The story was also successful in that Harry Dresden-magician was not the sort of magician who could wander at will into any scenario with wand aglow and come out unscathed, buoyed by an array of easily conjured spells. To the contrary. Each encounter is carefully contrived. Harry has to essentially armor up before every confrontation, attempting to plot out the scenario ahead of time. In Harry's words, "Wizardry is all about thinking ahead, about being prepared." This magic is very much a return to the magician in his alcove, brewing spells and studying how magic works to get a fuller understanding of it, not unlike the studious Jonathan Strange of Jonathan Strange & Mr. Norrell. Not that Dresden's world is entirely gimmick free (though not quite the same level gimmick as seaweed that can alter your genes to allow you, temporarily, to breathe underwater). Interesting hints are dropped about Dresden's past, the governmental bodies of magic users, yaddah yaddah. All the things a good writer includes that can't be revealed in their entirety during the process of a single case (hello, lucrative series... oh, how publishing companies love series). His approach to magic and convoluted history make him, with more than a dose less experience, angst, and turn of phrase, a nice mock up of Hellblazer: The Devil You Know's John Constantine. And, of course, there's my favorite character in both book and television, the massively-talented-uber-magician-turned-spirit-tied-genie-like-to-his-own-spell-covered-skull-due-to-some-horrible-magic-gone-wrong Bob. Bob is the magical savant. Bob is the guy magicians go to to learn something about magic. He's the wise man, the librarian, the loremaster, the sage, and as such, he's fascinating because you know he's going to have an answer for everything and it's going to be brilliant. He's the Gandalf/Dumbledore of this story, but held permanently out of the action because if he were the main character there wouldn't be a story. Page 1, mystery arises. Kapoof! Bob solves mystery, resolves loose ends, shoots 10 under par at Inverness, ends series by page 3. Fortunately for Dresden fans, Harry is a lesser sort of magician who consults Bob whenever he has a real brain buster. Where this story loses points, though, is in the simple fact that while the interesting mysteries, the hints at a larger picture, and the presence of a believable sort of magic, I wasn't overly convinced by Harry. This, ironically, in spite of the fact that he came across as a Normal Guy who just happened to know a great deal about magic. He was my guide throughout this story, and every so often there was something charming about him. His wit was rather flat. His observations frequently banal. Dresden was a good narrator where explanations of magic are concerned and a tolerable one everywhere else. One gets the impression that Dresden tells the story from retrospect as his observations are from the perspective of (bear with my ingenious prose here) an observer, even in situations where he is directly involved, yet the narrative distance this provides does not allow for any methodical analysis, maybe because Dresden is narrating the story to himself as it happens. In some cases this leads to some silly hyperbolic descriptions. At one point, Dresden is approached by a man with a sword, presumably aggressively. Dresden's description of the sword, which no doubt would have commanded most of my attention as well in a similar situation, was that it had "a blade about ten miles long". This is, understandably, a stressful situation conveyed by an obvious exaggeration, but it reads like Dresden is a total ham. Another, a few pages later, "His fist went across my jaw at approximately a million miles an hour," nearly drew an audible sigh (though he makes up for it with the end of the sentence "and I spun down to the ground like a string-cut puppet"). In most cases, I can imagine the internal dialogue narrated by Paul Blackthorne, and sometimes it passes that litmus test of plausibility. In this situation and numerous others like it, however, it didn't. Maybe Butcher struggled with a good description here and opted for brevity. Dresden comes across as someone who throws ropes with his words rather than weaving tapestries. They get you from point A to point B, but not much else. Maybe that's just another aspect of the hardboiled, plot-driven story that I don't appreciate. Dialogues came and went without any kind of economy, though some took place under the guise of economy. At one point, Dresden speaks to a bartender of few words. Dresden makes his typical bland observations in what you might think was an attempt to start a conversation (even though the other character was described as someone who didn't talk much), to which the bartender responds with grunts. This thwarted conversation goes back and forth for a bit, not really adding anything to the story and not really serving any purpose other than to confirm what we already knew about the bartender. Dresden just isn't that interesting a speaker, so it's sometimes painful for the reader to endure it. Moreso when other characters feel the same way and want him to just move on. I realize this is just one BIG complaint in a sea of praise, but for me, this is an important complaint. I'm a glutton for intellectual characters who think in more than just cliches. Again, maybe this is an aspect of hardboiled that must be present and allows readers to rocket through them--you know what's coming, you know it's needless description, you know you'll gain nothing from it, you skip over it, you save yourself 10 seconds of reading. Harry Dresden is a pretty powerful wizard, a pretty decent sleuth, with a pretty interesting history and lots of connections and experiences. But the guy is pretty bland otherwise, and if I had my choice, I'd have someone else tell me his stories second-hand than let Harry tell me himself.